In a previous blog, I described how the name of my firm, Willard Jones Real Estate, came about (Blog). While I did conduct a fair amount of research prior to filing the Articles of Incorporation with the State of Illinois, there admittedly have always been a few holes and questions surrounding the tale. 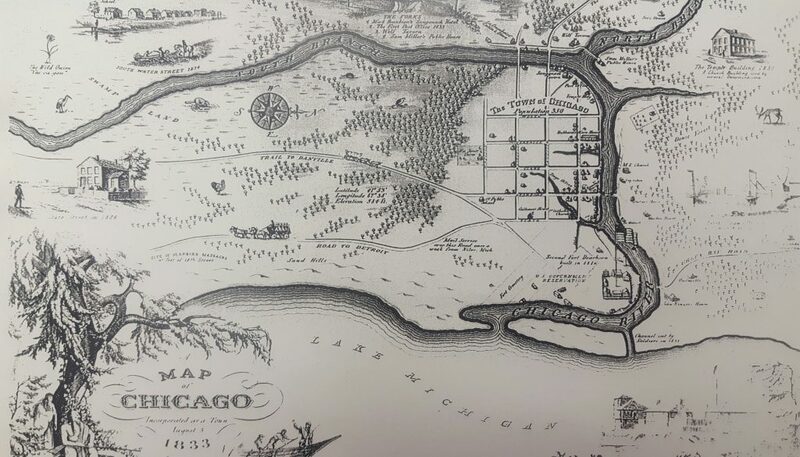 For example, I have never been able to firmly establish the exact boundaries of Willard Jones’ farm as it relates to present day downtown Chicago. Even worse, some versions of the cow path story list the land owner as “William” Jones instead of Willard. With all due respect to people named William, the name William Jones Real Estate just did not seem to have the same amount of pizzazz. What I didn’t know is that nearly 5 years after starting the company I would ultimately be able to fill in all of the gaps. On a November afternoon right before Thanksgiving, I received a call out of the blue. A woman from Alaska named Marilyn left me a voice message requesting that I phone her back, but provided no details regarding the basis of the call. I figured it probably was some sort of telemarketing campaign, but on the off chance that she was in need of office space, I felt compelled to respond. Much to my surprise, Marilyn from Alaska claimed to be the great great great granddaughter of Mr. Willard Jones himself. Her niece had done some online research and came across our company website. She mentioned this to Marilyn, who in turn reached out to me and shared that she recently completed a family genealogy project and dug up all sorts of information on Willard and his family. She offered to send me copies of the data, along with some pictures. I was still a bit skeptical and half expected a letter to follow asking me to pay an undisclosed sum of money to the family in order to keep using the name or face legal action. In the back of my mind, I was already dreading the prospect of developing a new name for the business. Nevertheless, Marilyn seemed like a nice enough person so I consented and told her to send it all over. Sure enough, about a week later, a giant tube arrived at my office filled with a treasure trove of fascinating information, including a picture of Willard Jones himself from the 1830s and an 1833 map of Chicago which shed some light on where exactly the Jones farm was located (see below for pictures of both). Among the other relics included was a complete genealogy of the family featuring pictures and another version of the 100 West Monroe cow path story that I had never seen. All of this information was absolutely captivating and thankfully, confirmed the fable of Willard Jones. He really did exist, truly owned a good sized plot of land in the present day Central Loop, actually maintained a farm on the corner of Clark and Monroe, and played a direct role in the creation of the famed cow path. 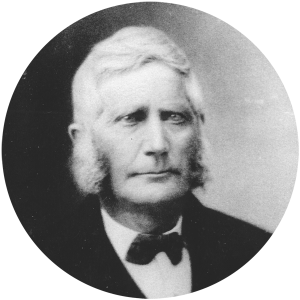 We even learned the reason why some of the stories contain the name William instead of Willard: William was Willard’s father and both lived in Chicago in 1833. Marilyn and I have communicated several times since the package arrived. In fact, she has uncovered even more information on Willard that is in route to my office; I cannot wait to see what it contains. Of course, our new pen pal has a box of authentic Chicago treats coming her way as well. In the end, as fantastic as it is to receive this information, I was equally heartened by Marilyn’s genuine act of kindness. Given the state of the world today, it is good to know that people like her still exist. I never could have imagined in my wildest dreams that my questions about Willard Jones, the man (and no longer the myth and the legend), would be answered by a random phone call from someone in Alaska. How wonderfully unpredictable life can be.